Disney animated film finds baby Tarzan lost in the jungle and raised by a gorilla family--patriarch Kerchak (Henriksen), nurturing mom Kala (Close), and bossy big sister Terk (O'Donnell). But, years later, a now grownup Tarzan's (Goldwyn) life is thrown into chaos when he first encounters humans--and realizes he is one. Eccentric gorilla scientist Professor Porter (Hawthorne) and his lovely daughter Jane (Driver) are willing to help, but jungle guide Clayton (Blessed) is the villain on the scene. Disney's animation is even more amazing than usual thanks to some new computer software that gives the jungle background unbelievable depth and Tarzan glides, surfs, and jumps in a wow! look! manner. Download Tarzan in Digital HD from the iTunes store. 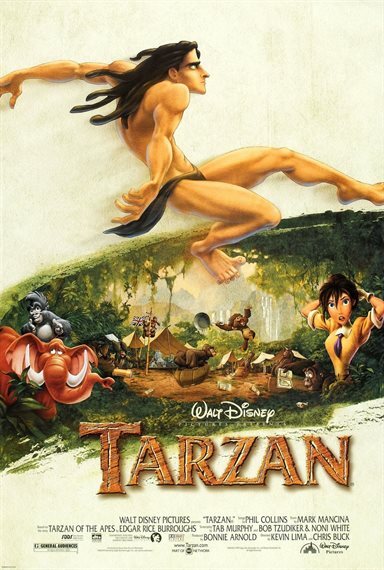 Tarzan images are © Walt Disney Pictures. All Rights Reserved.